Two new images from The Expendables 2 have landed online. 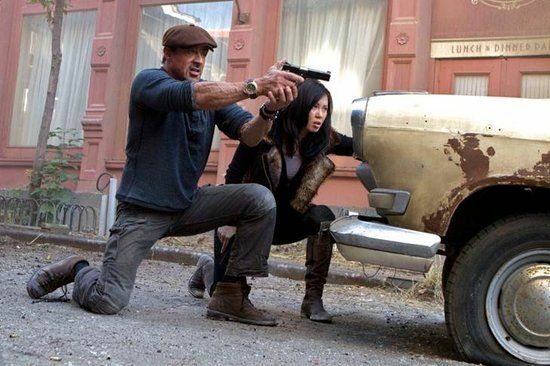 The images feature star Sylvester Stallone and franchise newcomer Yu Nan. Nan will makes sure the new movie isn’t a total sausage fest because, believe it or not, women can kill armies of faceless bad guys as well. Guns aren’t sexist. I have no idea what’s happening in these scenes, but I’m crossing my fingers I like the sequel more than the original. I desperately wanted to be a fan of the first movie, but it felt soulless and artificial. It’s not enough to simply see your favorite action stars sharing the screen. Hit the jump to check out the new images. The film also stars Jason Statham, Jet Li, Dolph Lundgren, Chuck Norris, Terry Crews, Randy Couture, Liam Hemsworth, Jean Claude Van Damme, Bruce Willis, and Arnold Schwarzenegger. The Expendables 2 opens August 17th. Images via EX2 Blog via ComingSoon.